Joseph Walter West (1860-1933) - born in Hull, Yorkshire, West studied at St John’s Wood School, the Royal Academy and the Academie Julien, Paris. He painted figurative and literary subjects and landscapes, his genre pictures were often Quaker subjects. 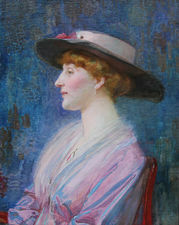 He exhibited 17 works at the Royal Academy and 4 at the Royal Society of British Artist. He was Vice President of the Royal Society of Painters in Watercolours and lived in Northwood, Middlesex. He is represented in the collections of many public galleries including the Tate, Birmingham and National Gallery of Scotland.